"We beat a team with 4 foreigners!!" 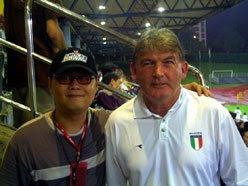 The star attraction of the night was, of course, Perak coach - Steve Darby. Every guy in the media loves him, no doubts about it. Whenever the former Home United coach graced any media conference, journalists are bound to be spoilt with choices of colorful quotes that are both eye-catching and at times incurred the wrath of the game authority of the land (eg: the “beep” test comments, remember? Ooops:P). 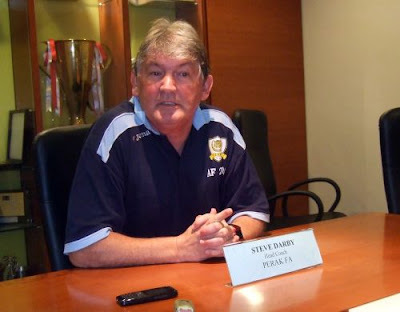 Coach Darby shared with us his thoughts of their victory over SAFFC in his usual witty humour manner which on and off drawn laughters from the pack, whom many had known him pretty well. 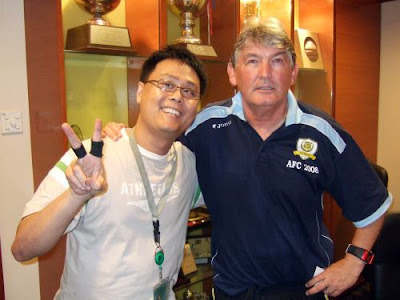 Here's the one took in 2005 at Woodlands Stadium.